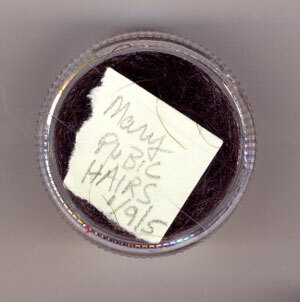 Description: Collection of the artist's pubic hairs collected and stored for later use, dated January 9 / 05. Five years to the day. Comments/Origin: As a collector and gleaner, I find everything very interesting. My own body hairs and toenails included. It represents the temporary nature of our bodies and our lives. It frees us to change and re-discover ourselves, embrace our own impermanence. As time passes we shed the old and open ourselves to the new.